“Other workouts have become so easy compared to yours,” is something I often hear from my Slim & Strong participants after a month of training. It’s great to hear that they build up so much strength, endurance and fitness that they see the difference quickly. While our Slim & Strong classes can feel like you got hit by a bus after your first time, there is a method to the madness and we don’t work out that hard just to show off. 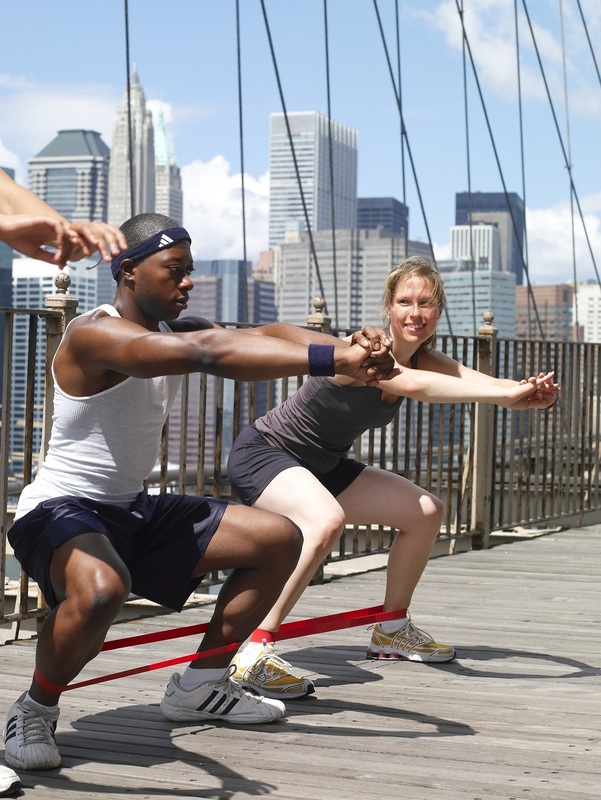 Our Slim & Strong and Brooklyn Bridge Boot Camp workouts follow the idea of high-intensity interval training, also called HIIT. This acronym means that for short periods of time you push yourself to maximum intensity and then follow it with lower intensity. The time at maximum intensity increases with regular practice and the time of lower intensity shortens as you get fitter. The idea of the workout is to maximize your workout time to get the most benefits. Many people care about how many calories they burn during a workout. They think the harder and longer they work and the more cardio they do, the more calories they burn. Similarly, they might think that the less they eat the more weight they lose. That’s actually not true. At least, it’s not the whole picture. When it comes to changing your body it’s not just about burning calories. It’s about which hormones you activate during a routine that make you burn body fat and gain lean muscle while ensuring muscle recovery and healthy body. – Adrenaline ensures you burn subcutaneous fat (the fat underneath your skin). – Growth hormone is released with strength training and bursts of high intensity that break the anaerobic threshold. Growth hormone is essential for getting you lean, boosting muscle growth and recovery, and keeping you young. It declines as you get older. – Your insulin sensitivity is improved. That means your cells need less insulin to make energy from the sugar in your blood stream. Balanced insulin levels are important to lose weight and stay healthy. High insulin levels are associated with a slew of health and metabolic issues, such as weight gain, pre-diabetes, diabetes, high cholesterol, metabolic syndrome, high blood pressure, obesity and various inflammatory conditions (including heart disease cancer, stroke and arthritis). – Short bursts of intensity (versus long and drawn-out cardio sessions) prevent cortisol build-up. High cortisol levels are associated with fat storage and muscle loss. The less muscle you have, the slower your metabolism and the quicker you gain weight. – EPOC is increased. This acronym stands for excess post-exercise-oxygen-consumption and it means you burn more calories following a high-intensity workout than after a low intensity workout. The after-burn effect can be active for up to 48 hours and means you might be burning an additional 20% of the calories you burned in your workout. The harder your workout, the greater the EPOC. – Nitric oxide production increases during a workout. This substance makes your blood vessels slightly bigger so that nutrients and blood can get to the muscles to keep them working hard longer. – Muscle breakdown: Long-drawn-out cardio sessions promote catabolism or muscle breakdown. Extensive cardio sessions make your body release the stress hormone cortisol. It makes your body use protein for energy. Since your muscles are made out of protein you will lose muscle mass. Long-term cortisol elevation also leads to fat storage in the face and waist: not a good look. HIIT isn’t meant to be done daily. Three times a week is ideal to promote recovery and muscle growth. – Stress on the heart: Recent research has found more and more that lasting stress on the heart can lead to something called “athletic heart syndrome”, where your heart becomes enlarged in order to keep up with the stress placed on it. It can also lead to an increase in your body’s stress response (high cortisol levels) and lead to an irregular heartbeat. However, we’re talking hours and hours of cardio and this should not be a concern for the average exerciser. 1) Does your workout change your body? Is it getting you leaner, fitter, stronger and more powerful? 2) Does it energize you and make you feel healthier? 3) Does it make you feel uncomfortable enough to promote change? If not, make sure you incorporate workouts that combine strength training and short bursts of cardio. The Slim & Strong workouts on Booya follow the HIIT model and are perfect at-home routines. Most importantly, don’t forget about resting your body. If you don’t give your body a chance to recover, you are not allowing your muscles to rebuild and recover and you’re actively breaking them down. Try yoga or go for a swim. Be good to your body and work with it – not against it. – Ariane Hundt, founder of Brooklyn Bridge Boot Camp. This entry was posted in Fitness Tips and tagged ariane hundt, boot camp workout, bootcamp, exercise, fitness, fitness boot camp, fitness workouts, healthy tips, high intensity interval training, hiit on April 30, 2014 by TeamBooya.